You are here: Home / Foodie / These tomatoes can peel themselves. Practically. 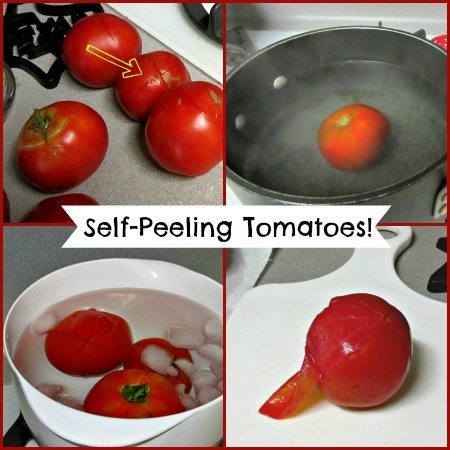 These tomatoes can peel themselves. Practically. It’s tomato season! Half a dozen just came in from the garden yesterday. And I know I’m not the only person who won’t just bite into a tomato like an apple. I like them peeled, with all of that seed-gooky-stuff taken out. Last year I tried the age old tip to remove the peels. It’s so easy, it’s ridiculous. Now. A lot of projects/tasks on the internet claim to be “easy” and turn in to something so difficult or time consuming you want to cry or beat your head against a wall. This is not one of those hurtful claims. Bring a small pot of water to a boil. Fill a small mixing bowl with water and LOTS of ice. Use a knife to cut an X in the bottom of each of the tomatoes. Working 1 or 2 at a time, place the tomato into the boiling water. After about 20 seconds, use a slotted spoon to transfer the tomato from the pot to the ice water. (This stops the tomato from cooking any further). Once cool, take the tomato out of the water, and the skin should slide off practically on its own! This method also works well with peaches! Previous Post: « Don’t let Pinterest get you down!